The Hill-Sachs fracture results from anterior dislocation of the humeral head and is located on the posterolateral aspect of the humeral head. 97 % of shoulder dislocations are anterior in direction. This fracture is produced when the humeral head strikes the inferior margin of the glenoid. The dislocation may also cause a Bankart fracture at the impact site on the glenoid. Anterior dislocations are produced by complex forces acting on the humerus, including abduction and external rotation. 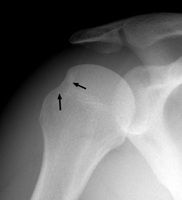 A AP radiograph of the shoulder. The arrows indicate the defect on the posterolateral aspect, corresponding to a Hill-Sachs fracture.